The Geneva Bible is a sixteenth century English translation with extensive notes. Expatriate Calvinists produced the Geneva Bible during the reign of "Bloody" Mary, and it appeared in a variety of editions thereafter. It was the English Bible of the Reformation, but its popularity displeased King James I. As far as he was concerned, a king ruled by divine right and was in a better position than his subjects to determine what sound doctrine should be. When he wasn't suppressing separatists, he commissioned what ultimately became the most influential (and note-free) translation, the King James Version. But the success of the KJV was not immediate. It was the Geneva Bible, not the KJV, that Pilgrims carried with them to the New World. (William Bradford, for example, owned a 1592 edition.) Much has been written about the significance of the Geneva Bible, but interest today is largely antiquarian. In the 1990s, when a name was needed for a new Reformed study Bible, the publishers called it The New Geneva Study Bible. Today, the name has been changed to Reformation Study Bible -- presumably because consumers didn't "get" the reference. For all its former glory, the Geneva Bible is now covered in a thick layer of dust. FACSIMILES ABOUND That doesn't mean it's forgotten -- or even particularly inaccessible. A variety of facsimile editions are now available to readers. They tend to be expensive, unweildy and (thanks to sixteenth century typography) difficult to read. The massive leather-bound L.L. Brown facsimile of the 1599 Geneva Bible has been on my shelf for several years. When I first delved into it, I was surprised at how helpful the notations are for study. The goal of the notes is typically to steer the reader through the "argument" of the passage. Working through them, you develop a real appreciation for how the theology of the Reformation is derived from the text. Which is not to say that modern readers, even Reformed ones, will agree with everything they find. The value of the notes, as compared to those found in many study Bibles today, is that, in addition to clarifying ambiguities, they present a running "reading" of the text. I have no trouble seeing what made the Geneva Bible so appealing to its original audience. But in facsimile form, these benefits are not exactly accessible. Read through a few pages of this facsimile of the 1560 edition and you'll see what I mean. It's not hard to make out -- particularly if you have experience parsing early modern typography -- but it's not exactly easy, either. Given its significance, I've always wondered why an edition of the Geneva Bible with updated spelling and typography isn't available. There is a lot to love about the new Tolle Lege edition of the 1599 Geneva Bible: updated typography, modernized spelling and punctuation, practical proportions. In one bold stroke, the original study Bible has been brought up to date. The changes are conservative -- this is still very much a sixteenth century Bible -- but they make a big difference. Imagine you've been reading a facsimile of the 1611 KJV all your life, and then suddenly you're given a modern Cambridge KJV. The quality of the Tolle Lege edition isn't up to Cambridge standards (more on that in a bit), but you get the idea. This is a big event. It makes a classic milestone safe for non-antiquarians. My first thought on flipping through the pages was that something had to be missing. After all, my 1599 facsimile is huge, and the words are literally crammed onto the page. The Tolle Lege edition is slender in comparison, and the pages, while full, are well-ordered in a way the 1599 Geneva Bible rarely is. It just goes to show what small, clear type and thin Bible paper can do. To be perfectly honest, the thing that has always interested me about the Geneva Bible isn't the translation itself, but the notes. They strike an interesting balance between the pastoral and the theological -- or perhaps I should say that they blend the two, as if there is no proper distinction to be made. I'll try to illustrate this with just one example. 1 Corinthians 4:7 reads, "For who separateth thee? and what hast thou, that thou hast not received? if thou hast received it, why rejoicest thou, as though thou hadst not received it?" 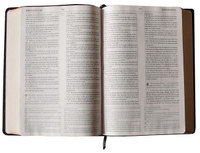 The Geneva Bible makes two notes on the passage. First, it offers some practical application: "He showeth a good means to bridle pride: first, if thou consider how rightly thou exemptest thyself out of the number of others, seeing thou art a man thyself: again, if thou consider that although thou have something more than other men have, yet thou hast it not but by God's bountifulness. And what wise man is he that will brag of another's goodness, and that against God?" Then the Geneva Bible draws out a theological implication of the passage: "There is nothing then in us of nature, that is worthy of commendation: but all that we have, we have it of grace, which the Pelagians and half Pelagians will not confess." What can I say? Take them for what they are -- a valuable but by no means perfect reading of Scripture. And remember this, too: the fact that the Geneva Bible was the Bible of the English Reformers, Puritans and Pilgrims does not mean that they shared all of its interpretations. I grew up in a church where everybody had a Scofield Bible, but that didn't mean they accepted everything it taught. So reading Scofield offered a window into their belief system, but not a perfect one. Tolle Lege is a small operation taking on a big project, and my appreciation for their efforts is huge. And when it comes to having an accessible, modernized Geneva Bible, this is the only game in town. Not surprisingly, though, this edition is plagued by the same quality problems that characterize so many genuine leather Bibles today. The design is good where it is conservative, but it isn't always conservative. There is a lot of text in the introductory sections rendered in boldface and underlined, which makes it a little hard on the eyes. The important pages, though -- the text and notes -- follow the conventions familiar to most KJV readers. I would have prefered a paragraphed text, modeled on the New Cambridge Paragraph Bible. (Norton's work is cited in the Preface.) Still, this traditional arrangement is appropriate for the project and is a vast improvement over the facsimiles. Unfortunately, the impression is uneven, so some pages are dark and others are light. The text isn't always consistly placed on the page, either. I've included a photograph of a heading in 1 Chronicles that ventures very close to the edge of the page. Typographically, there are a variety of little problems. For example, Psalm 45 flows a single line from the inside left-hand column to the top of the inside right, leaving the words "give thanks unto the world without end" floating in white space. Most people don't notice design anomalies like this, but there are enough of them here to make an old typesetter like me want to fix them. The real shortcomings, though, are the ones you'd expect. The leather cover is thin and hard. Today's genuine leather feels like yesterday's bonded leather -- but that's a universal problem. By the time I'd turned every page, breaking the bond left by the gilt edges, the front cover had already "lifted." The same thing happened, by the way, with the New Cambridge Paragraph Bible. There is a limited edition bound in calfskin that sells for $400, but I haven't seen any photographs, so it's hard to say whether the enormous expensive is justified. To sum up, the quality is adequate but not ideal. With a little more attention to the interior design and a better cover, Tolle Lege would have knocked one out of the park. As it is, though, this edition is a must-have for anyone interested in the history of the English Bible or the Reformation. Until now, your only option was a hard-to-read facsimile. The Tolle Lege 1599 Geneva Bible makes the people's Bible accessible once again to the people.